The 4 star Atrium Fashion Hotel was inaugurated in 2007 and is situated in the center of Pest, right next to the Blaha Lujza square. 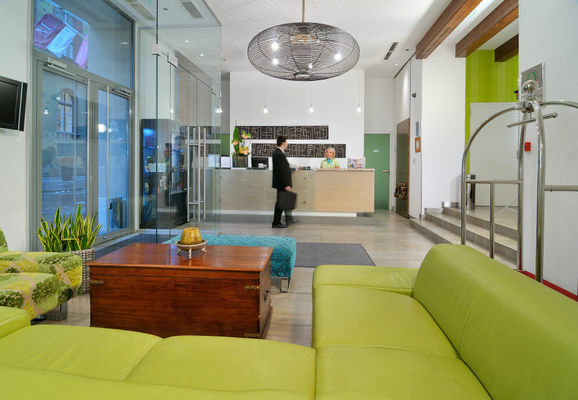 With its unique athmosphere and furniture this hotel follows the brand new tendencies and is an exemple of the new quality concepts of hotel industry. With its particular style and ultramodern equipment it is ideal both for business men and families and groups. Thanks to its central situation it is very easy to reach the hotel from any point of the city and the most important tourist attractions are also very close. In the surroundings you will find many restaurants, coffee shops, shopping centers and offices. There are metro, bus and tram stops right next to the hotel. The rates include buffet-breakfast and VAT, free use of in-room WIFI/internet and tea/coffee making facilities. The non-smoking hotel has 57 stylishly furnished rooms. All of them have air conditioning. The windows are soundproof and the furniture is comfortable and they assure the perfect relaxation in the very city center.